Hi from holidays! *waves* I am trying to fit blogging to my daily schedule which consists of sleeping (long! ), having a (long) breakfast, sweating (it is hot down here), swimming, hanging out at the beach and trying to find the fish bones during a prolonged dinner. You see there is little time left between these duties. As excited as it is, a new addition to Suqqu line, Eye Color Palettes deserve to be featured sooner than later. 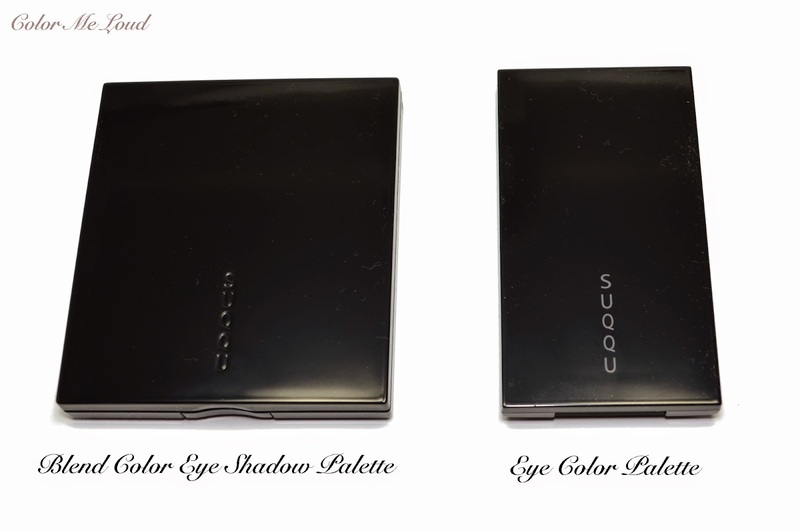 Suqqu Eye Color Palettes include three eye shadow shades. 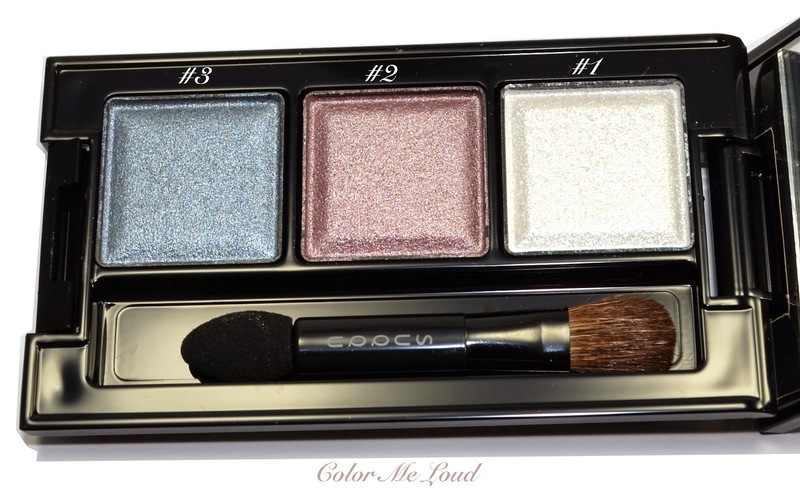 The sizes of each pan is close to the each eye shadow shade in Blend Color Eye Shadow Palettes. A small brush is included, one side has sponge tip and the other side has the cutest tiny Suqqu real hair brush to blend. Since there is only room for one small brush (not two), the compact is smaller in size. 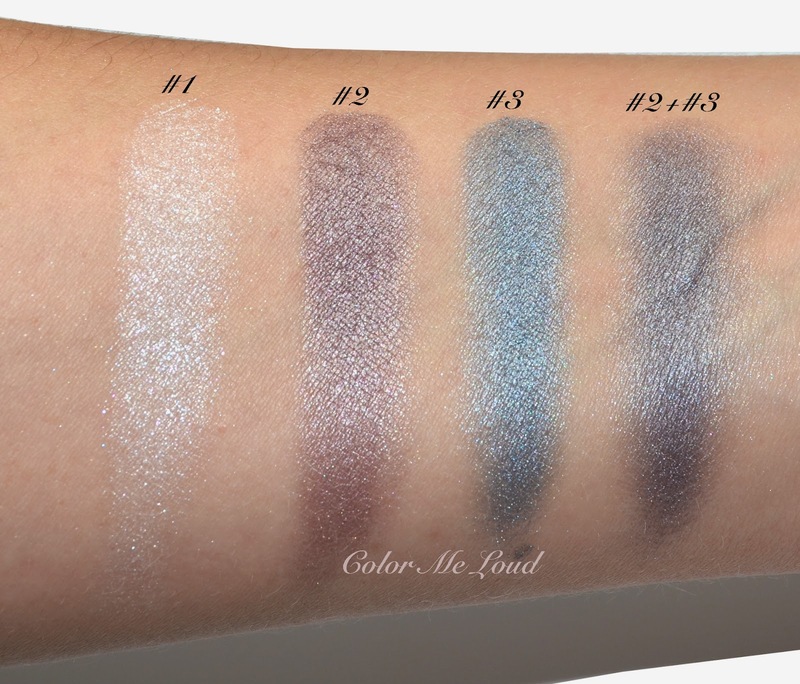 Eye Color Palettes (trios) are slightly longer than quads and a little wider than the half of the width of Blend Color compacts, you can see a size comparison below. 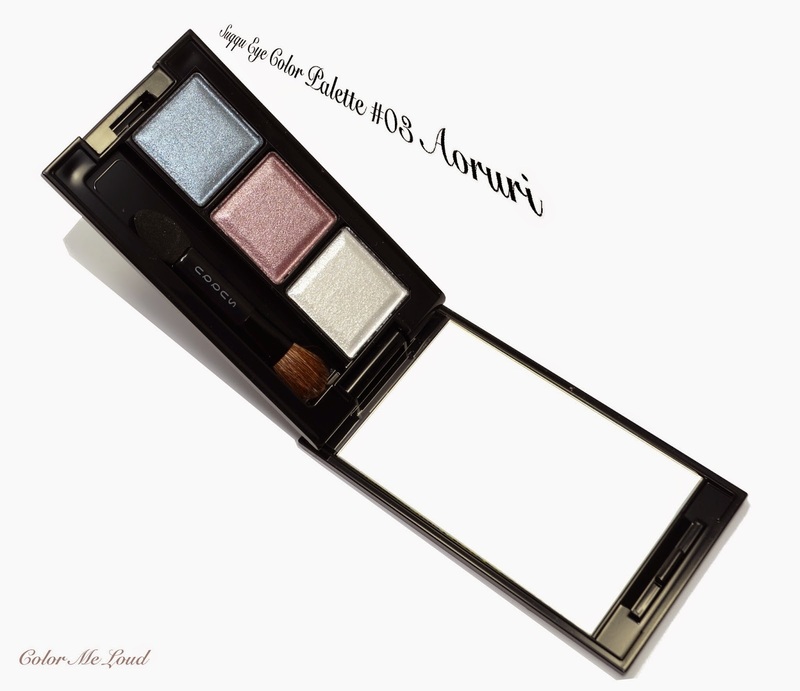 Suqqu Eye Color Palette #03 Aoruri is the blue trio of the line, Aoruri meaning Lapis Lazuli in Japanese fitting to the jewelry theme of the collection. The top most shade is for highlighting. 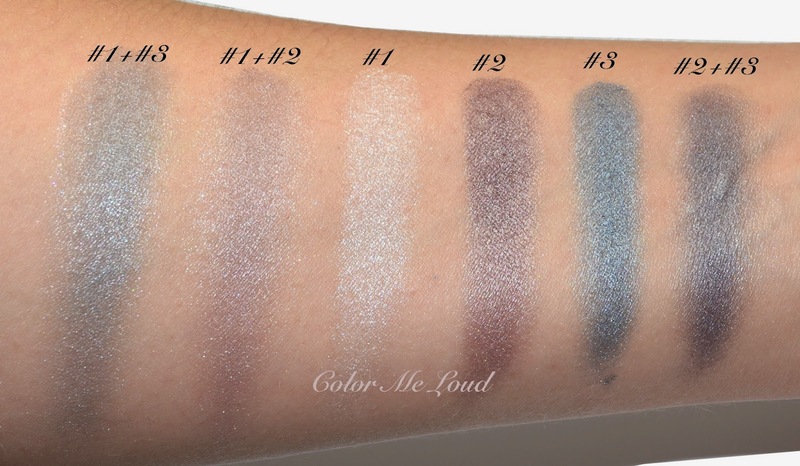 I found the highlighter shade more shimmery than Blend Color Eye Shadow (quad) base shades but we are talking about Suqqu, so there is nothing over the top. Aoruri has two color shades with similar depth, a mid toned pearly blue and a warm plum which is a tad deeper. Top (#1): A shimmery light white highlighter shade, which is the most shimmery shade in the palette. It can be used on its own on the corner or under brow bone but my favorite usage must be to layer this on other shades to bring a little bit of something or to go from a day makeup to a night one. You can see this shade layered with other two on the second photo below. Bottom (#3): A mid-toned turquoise blue with complex shimmer. As lovely as it is alone, it can also be layered with #2 to give a complex cool toned taupe. Below I have used top (#1) white shade on the inner corner and blended it over the blue which I applied on the middle of the lid. I then added the plum at the outer corner and blended it with blue. The resulting look on the eyes was not shimmery, rather iridescent but if I would like more shimmer, I could run a layer of the white shade. Here is the look in context (so called FOTD). Suqqu Eye Color Palette #03 Aoruri on eyes, Creamy Glow Lipstick Moist #09 Zakuroseki on the lips and Balancing Cheeks #01 Momoshuiro Blush Duo on cheeks. After applying this makeup, it reminded me of mermaids and the iridescent tail of her, may it be because I was already at a sea holiday mood? Final thoughts: The magic of Suqqu is in layering, so three shades give six possible combinations and it is full of surprises. I love the plum and blue and how they turn out once they are layered. The white can be used as a highlighter but can also be layered on other shades for more shimmery look. 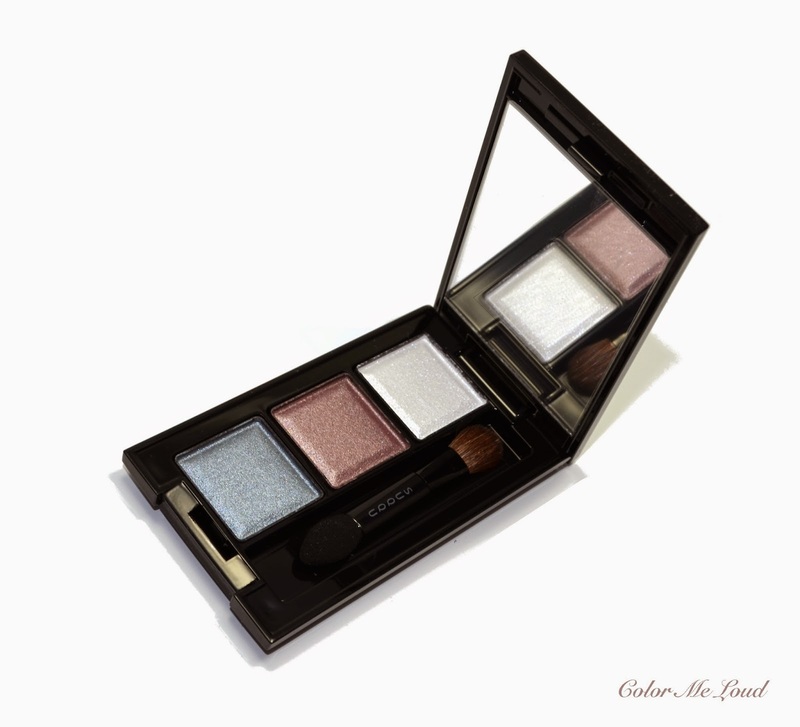 All in all I am very pleased with the usual Suqqu quality, creamy and pigmented, complex and not over-the-top shimmer as well as fun shades in Aoruri. I definitely recommend it. 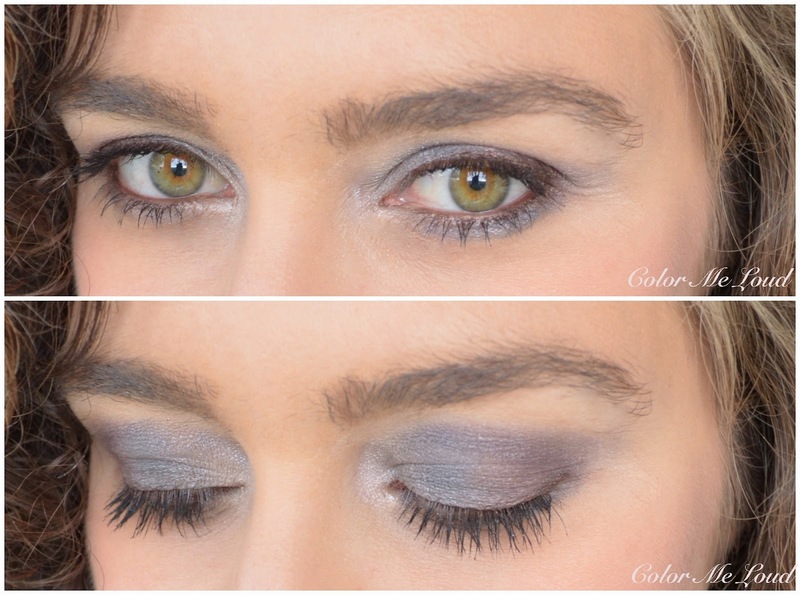 Do you experiment with layering and mixing your eye shadows or do you like using them straight from the pan? The products in this post are provided for my consideration. WOW!! 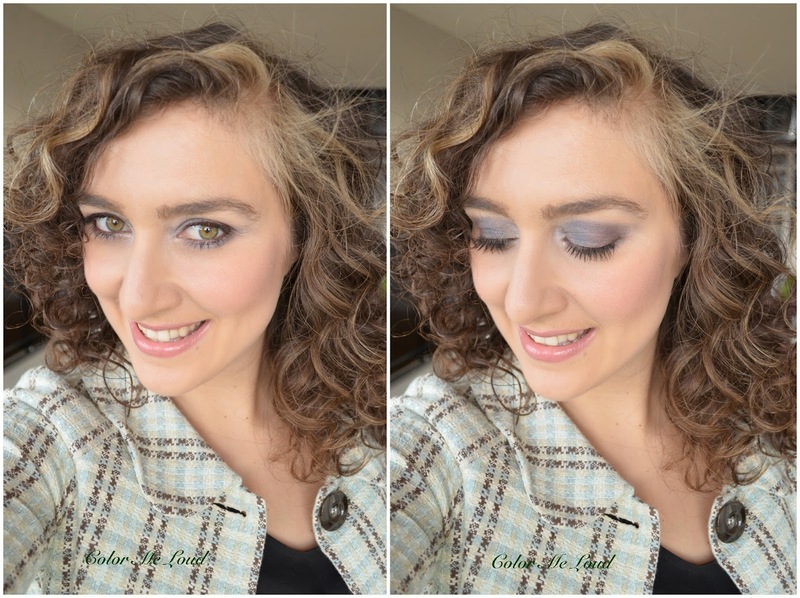 Amazing look and combination swatches! This really does evoke a lapis lazuli beauty, and so happy to hear these are permanent! Thanks, holiday has just begun but I already feel relaxed, carefree... Love it! Thanks for all the swatches, Sara! I'm really terrible... i usually just use the shades straight out of the pan, as I can't imagine beforehand what mixed shades look like! But you've inspired me! I'm 99.9% sure that these colors will not work for me, but these beautiful pictures are giving me pause. How can you be so sure, after seeing you rocking the navy liner, I am certain that turquoise blue will flatter you. You can wear anything Belly :-* LOL for the long pause, LOL again.